Some pizza purists maintain that the only “real” pizza is the Margherita. Others will argue that the Pizza Marinara predates the Margherita. True diehards insist that the Pizza Bianca, with just olive oil and sea salt, is clearly the oldest form. When I was getting started in the business toppings were limited to sausage, mushrooms, and anchovies. Well, times have changed. Creative pizza makers like Rome’s Gabriele Bonci, and our own incomparable Tony Gemignani are changing the way people think of pizza possibilities. Even in New York where the cheese pizza was always, king artists such as Andrew Scudera at Goodfellas in Staten Island are producing incredible pizza (check out his shrimp, crab, and lobster pie with black Sambuca romano sauce). 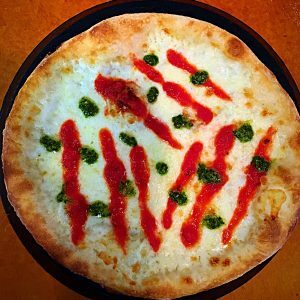 Sure there will always be a place for the classics but amateur and professional pizza makers are expanding the boundaries of pizza as an art form and bringing diversity, creativity and excitement to the world of pizza, which is certain to attract a new generation of chefs and consumers. Every great pizza maker has a signature pizza or an identifiable pattern when choosing toppings. 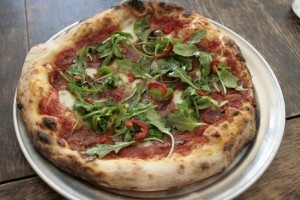 A true pizza aficionado can easily identify a Chris Bianco pizza and distinguish it from a Paulie Gee pie. We will cover how to combine flavors in our next instalment but for now lets explore the basics of how to top a pizza correctly for the best result. Remember, these are suggestions. I’m an old hippie so I’m not too big on hard and fast rules. Order of placement changes everything. Let’s try an experiment. Extend 2 dough balls. On the first one construct a basic pizza margherita. Put the sauce down first place a few basil leaves at random. Top with fresh mozzarella and a drizzle of olive oil. Bake and serve. On the second dough place mozzarella and bake. After the pizza is baked splash with tomato sauce, drizzle with oil and finish with fresh basil. Using the same ingredients you will have two completely different results. The second pizza is a variation of Franco Pepe’s Margherita Sbagliata that is taking Italy by storm right now. Sbagliata means “wrong” but you can’t go wrong by heading to Caiazo and experiencing this simple but elegant pie. NOTE Franco spots this pizza with pesto instead of basil. Let’s try another experiment that hits closer to home. Stretch 2 more dough balls. 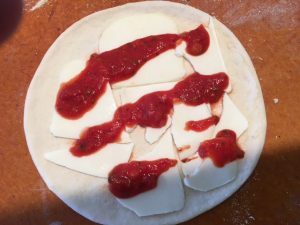 On one, construct a standard NY style pizza placing sauce down first, sprinkling with Romano cheese and topping with shredded low moisture mozzarella. On pizza number two lay down low moisture mozzarella that has been sliced instead of shredded. Now splash the pie with pizza sauce and a generous sprinkle of Romano and bake. Same ingredients as the first pie but pizza number two will be crispier, the sauce will taste different and the cheese will be creamier. So what happened? By placing the cheese down first you have created a butterfat based barrier between the water in your tomato sauce and the crust, resulting in a crispier pizza. By placing the sauce on top of the cheese you have protected the cheese from breaking down in the heat of the oven, resulting in a creamier finished product. As expected the sauce on top has been exposed to more heat than it would have been if it were under the cheese, so the tomato flavor is now more concentrated. The pizzerias in Trenton NJ have been using a similar method for almost 100 years and frankly this is usually the way I make pizza for myself. Shredded mozzarella with sauce on top, South Jersey style! Vegetables placed on a pizza before baking should be pre-cooked. Roast, sauté, blanche or grill. That’s your call, but I can assure you that most veggies will taste better if they are cooked to concentrate flavors, evaporate moisture and produce some caramelization. If you choose to use raw vegetables, such as arugula or tomatoes, place them on pizza after baking. Delicate cured meats, such as prosciutto or brasiola, should be added to the pizza immediately after it comes out of the oven. These toppings don’t like heat and will dry up and become flavorless and tough if they are in the oven. Even the Italians, who bake for 90 seconds or less, put these toppings on when the pizza is finished baking. When topping a pizza with any type of salumi or charcuterie be sure that the meat is sliced (very thin) just before you use it for optimal flavor. 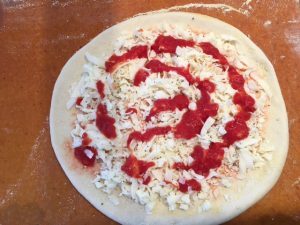 With all toppings, always start at the outside near the sauce line and top towards the center diminishing the concentration of toppings as you move in. Avoid what is known as ‘’center loading”. The toppings are going to move towards the center as the pizza bakes anyway and the center is the weakest point. Guest Column: Pizza Crust — What Happened? Great post John. I really am amazed how true this is. Pizza is quite simple as it is and just moving things around really does affect the outcome and the experience. One of my favorite things is to add some cool fresh mozzarella to my pies after baking. This adds an entire new layer of flavor to the melted mozzarella and a nice textural and temperature variation to the experience. As the cool mozzarella slowly warms up from underneath it continues to change. Fascinating! Nice touch, Brad. Other than Parmesan or other dry aged cheeses, I’ve never seen any pizzeria add fresh or soft low moisture cheese after the bake. John, have you ever encountered this? It’s a fascinating idea. 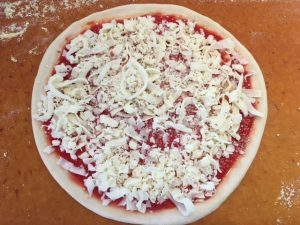 I have never been to Oneonta, New York but there is a pizza place there called Tino’s that originates the ‘cold cheese pizza.’ Its a pizza covered in cold low moisture mozzarella right after it comes out of the oven. I read they started making them because drunk college kids were burning the roofs of their mouths by eating hot slices of pie right out of the oven. I guess they had lines out the door and were cutting pies and serving slices as fast as they could and multiple peoples were burning their mouths, and as a way to help the drunken, cold cheese pizza was born. That’s a great story, Aaron — thanks!!! I’ll have to look into that. Not even sure where Oneonta is but I’ll try to track down Tino’s! What a great idea they came up with — Brad has gotta love this one! Thanks David! This sounds pretty awesome, and I love that they finish it with cold mozz and provolone — I love provolone on pizza!